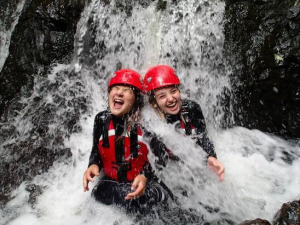 Gorge Scrambling at Hawk Adventures ScramblingGorge Walking is an adventurous journey through a steep sided river gorge, where you will find yourself Walking, Climbing, Swimming, Scrambling, Squeezing, Traversing, Balancing and Jumping. If climbing cascades, crawling under waterfalls and jumping into deep pools sounds exciting, then this is for you! For those who want to get stuck into an activity that challenges throughout, Gorge Walking is the one to choose. Negotiating our way along one of the South Wales river gorges, you will visit places that you never expected or thought possible. It combines the best of rock and water activities, with some great scrambling and jumps from 1 to 20 feet into safe water. There's so much to do and something for everyone, whether they can swim or not, we even run a drier version for those who don't want to get wet and for those chilly winter months, you can go even if there's snow.